The United States Congress designated the Saguaro Wilderness (map) in 1976 and it now has a total of 70,905 acres. All of this wilderness is located in Arizona and is managed by the National Park Service. The Saguaro Wilderness is bordered by the Rincon Mountain Wilderness to the east. Sprouting in the shade of another desert plant, the saguaro cactus grows only a few inches in its first five years of life and a few feet in its first 30 years. At age 75 the cactus stands 15 to 20 feet tall and begins developing its first branches as it absorbs water through an extensive root system. A mature cactus can live up to 170 years, often measuring in at over 30 feet tall, weighing 6 to 10 tons, and holding one ton of water. The saguaro is truly king of the Sonoran Desert. 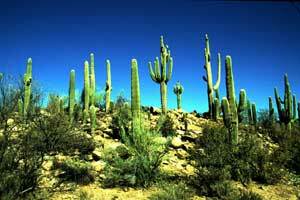 Saguaro Wilderness is situated within the Saguaro National Monument preserves thousands of acres of saguaro cacti. Divided into two units by Tucson, the western Tucson Mountain Unit is relatively flat and the eastern Rincon Mountain Unit rising steeply in places from 2,800 feet to 8,666 feet on Mica Mountain. Most of the park has been designated Wilderness. The Tucson Mountain Unit receives mostly day-use visitors and the Rincon Mountain Unit attracts both day-use hikers and backpackers. Saguaro's Wilderness trail system contains approximately 127 miles of maintained trails, but overnight camping is limited to six sites in the Rincon Mountains. Water is usually available. Planning to Visit the Saguaro Wilderness? How to follow the seven standard Leave No Trace principles differs in different parts of the country (desert vs. Rocky Mountains). Click on any of the principles listed below to learn more about how they apply in the Saguaro Wilderness.